There are two types of poems: poems that are meant to be read and poems that are meant to be spoken. The spoken word tradition, where performance and storytelling are intertwined, goes back thousands of years and spans many cultures. In the 21st Century, poets have at their disposal not just the ability to record their own voice, but also a dazzling array of technology to articulate their vision. Audio sampling, digital manipulation of video and visual images, and multimedia platforms disseminates our ideas to a potential audience of billions and gives the creative spirit a palate of tools that would surely be the envy of any artist throughout history. 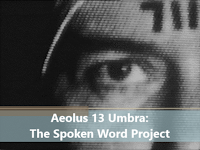 Aeolus 13 Umbra: The Spoken Word Project is a series of what I refer to as “produced poems.” Rather than just recordings of me reading my work, I draw upon my background as an audio producer for commercial and public radio to layer the pieces with audio samples from TV and film, speeches, ambient audio, and related media to give an extra layer to the work and bring out to the listener another dimension that could never be experienced on the printed page alone. – An aural history of post-war America. – As we are now, they once were. As they are now, so shall we be. – He’s a state of mind. – Not every journey has a destination. – Rhyming verse influenced by medieval death poetry. – Truth is transcendent even in the most common of everyday objects. – Self-determination is an illusion in post-modern consumer culture. – Jim Morrison, James Dean, Jack Kerouac. ‘Nuff said. – From stars we were born, to stars we shall go.